All teas (whether they be Black, Green, Oolong, White, and Pu'erh) are produced from the dried leaves of an evergreen shrub; Camellia sinensis. There are numerous infused beverages referred to as ‘tea’ (including Rooibos and Camomile ‘tea’) which do not contain Camellia sinensis leaves. Such drinks are more accurately described as herbal tea or tisane. Camellia sinensis comes in two primary varieties; the Camellia sinensis sinensis plant strain originated in China and is usually used to make green and white teas. Some Black teas and Oolong teas are also made using this variety. Camellia sinensis is native to Asia but is now grown all over the world. It grows best in loose, deep soils, at high altitudes, and in sub-tropical climates. There are many such environments in Africa. Yswara sources tea from numerous African countries including Rwanda, Malawi, South Africa, Burundi and Kenya. The flavour of a particular tea is determined by the specific Camellia sinensis cultivar, the quality of the plucked tea leaves, the manner and the quality of the production processing and (where applicable) the blending that they undergo. Tea production falls into one of two styles (Orthodox or Non-orthodox, the latter usually being referred to the 'Crush-Tear-Curl,'/CTC method). Yswara teas are all produced using the Orthodox method. Both production styles generally involve five basic steps (some teas do not undergo all of these steps, while other teas repeat certain elements. The core steps are: plucking, withering (allowing the leaves to wilt and soften), rolling (to shape the leaves and wring out the juices), oxidizing, and firing. The terms Black, Green, Oolong, White and Pu’erh refer not to distinct plant cultivars but rather to characteristics created by processing. Such processing alters the shape and chemistry of the tea leaves which results in taste, texture and aroma differences. Tea production falls into one of two styles; Orthodox or Non-orthodox. The latter is usually referred to the 'Crush-Tear-Curl,'/CTC method. CTC was invented in the 1930s specifically to save time and reduce costs within the mass market black tea industry. Both methods include the 5 basic steps (plucking, withering, rolling, oxidising, firing) of tea production but the time and care taken in these processes differs by method. The quality and price of the output also differs. Step 1. Plucking: The leaves are harvested by hand. After plucking, the leaves are sorted so as to remove stems, twigs, broken leaves, etc. are removed. Step 2. Withering: The leaves are then laid out to wilt and wither for several hours. In the withering process the leaves become pliable which is necessary for subsequent stages in the production process. Step 3. 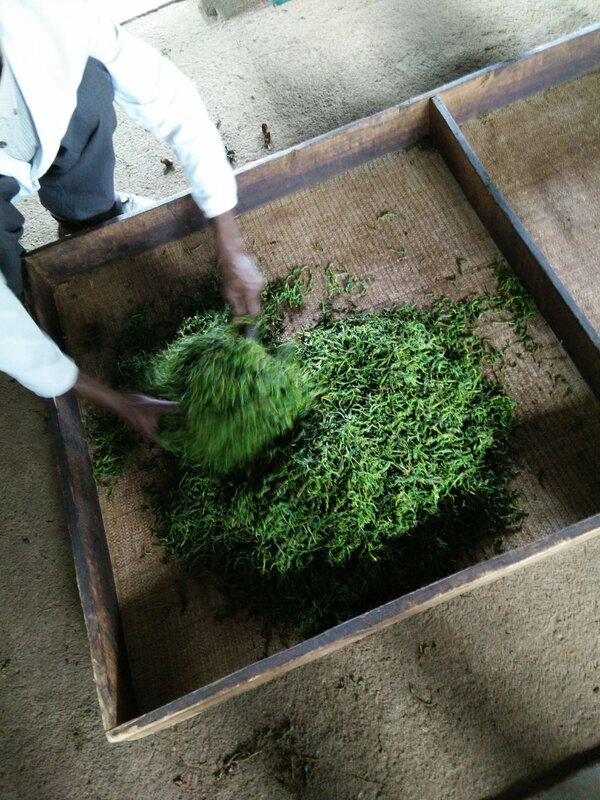 Rolling: The pliable tea leaves are YSWAthen rolled by hand or with rolling machines. This rolling breaks the cell walls of the leaf which exposes enzymes and essential oils in the leaf to oxygen. Step 4. Oxidation: After rolling, the leaves are laid out to oxidise for several hours. Oxygen in the air interacts with the now-exposed tea leaf enzymes. The chemical composition of the leaf changes and a red/brown colour forms. The length of oxidation is a significant contributor to the style and flavours in a particular tea. Depending on the type of tea, from here the leaves could be rolled again and oxidized further, or not. Step 5. Firing: The final step in the production process is to "fire" or heat the leaves quickly to dry them to below 3% moisture content and thereby stop the oxidation process..
CTC, or Crush-Tear-Curl production is a very different process. All five steps of Orthodox processing are performed, but much more rapidly. Tea leaves are crushed/ finely chopped and minced by machine. Because the leaf is completely broken up the oxidisation process is very quick. A whole batch of tea can take just two hours to process whereas the same quantity can take up to 24 hours to produce within the orthodox system. Quick translates into cheap for consumers and profits for manufacturers. Teas produced by way of CTC method have one-dimensional, assertive flavours with a pungent astringency. The rapidity of the oxidation process reduces the scope of flavour and aroma that can develop. The CTC process of chopping the leaves into small, uniform pieces makes it impossible for the leaf to hold on these essential oils. Consequently CTC teas lose their flavour and quality much more quickly than those produced using orthodox methods. If properly stored, teas produced using Orthodox processes can keep for up to 2 years. CTC teas typically keep their best taste for only 4-6 months. Most CTC tea ends up in tea bags. Tea bags are often over 6 months old by the time they arrive at the supermarket. Tea blending refers to the process whereby different teas are combined to produce a final product. The aim of blending is to create well-balanced and deliciously distinct flavours. Additions from plants other than Camellia sinensis in the form of leaves, fruit, spices and flowers also occurs. Yswara teas are generally blended.